Best Canister Vacuum Cleaners under $300 dollars – This is a roundup of the best rated canister vacuums currently available with a price under $300. Canister vacuums have traditionally been ideal for hard surface floors (tile, wood, stone), and low pile carpet or rugs. These type of vacuums store dirt in two ways, bagged or bagless. Bagless vacuums store dirt in a dust cup, and have a main filter. Both bagged and bagless can have HEPA filtration to prevent what you are vacuuming from getting in the air you breath. Most lower priced canisters (under $200) will not have the durability of brands such as Miele, and most do not have good consumer reviews. The canister vacuums on this page have excellent consumer ratings. 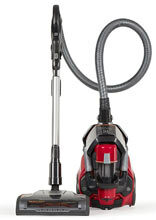 Below are the top rated canister vacuums $300 and under, listed with top features, and reviews. 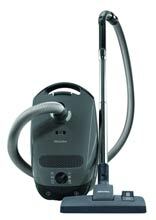 Bagless Vacuum = A bagless vacuum stores dirt and dust in its onboard dust bin which is detachable. To take the dust bin to your trash can, to empty it. You do not need to purchase bags. Some you will have to clean the filter from time to time. Bagged Vacuum = A bagged vacuum stores all the dirt and dust in a disposable bag. 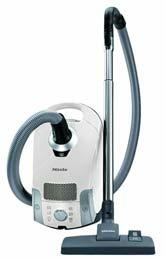 Some are self sealing (Miele), so that dust does not go everywhere when you remove the bag. Bagged vacuums usually have a larger capacity to store dirt and dust than Bagless Vacuums. The filtration system is built-in to the bag. HEPA Filter/HEPA Option = A HEPA filter is the best type of dirt filtration on a vacuum. This will remove the smallest particles of dirt, dust, and pet hair so that you don’t breathe in what you are vacuuming. This is especially important for those with allergies. Some vacuums have a HEPA filter option, where you can upgrade it to HEPA by buying an optional filter. Handle Brush Control = This allow you to control the rotating brush on your cleaning head from your handle, instead of bending over to turn the brush on and off. Power Settings = The Miele brand canister vacuums gives you 6 power settings on a rotary knob. The lower the setting the quieter the vacuum, and a lower suction setting is better for delicate fabrics, rugs, and drapes. Other vacuums give you some control of the suction, but will not quiet the vacuum like the Miele vacs do (Miele lowers suction by slowing the motor). Automatic Cord Rewind = A convenience feature that allows you to press a button and a reel will automatically roll up the cord inside the vacuum. Extension Hose = A vacuum with an extension hose, allows you to vacuum not only the carpet or floor, but to vacuum upholstery, drapes, stairs, and walls. All Canisters have this option. Mini Turbo Tool = Dyson Animal Vacuums include a mini turbo tool to vacuum upholstery, car seats, and other areas. This is especially useful for removing pet hair. Air Turbine Brush = The air turbine brush is a handheld air driven tool to vacuum upholstery, car seats, and other smaller areas. This is especially useful for removing pet hair. Stainless Steel Wand = Miele Canister Vacuums use stainless steel for their wands, and not cheaper metals seen on other brands, for long-term durability. Quiet Vacuums = For a quieter vacuum, Miele Canister Vacuums are designed to be quieter than other brands of vacuums. They have power settings that lower motor noise, and are sound insulated. This is important so as not to disturb others, and your pets.